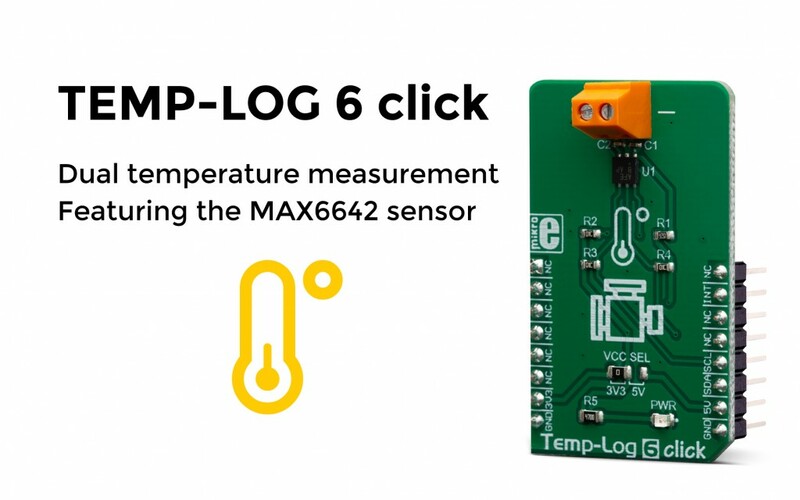 The Temp-Log 6 click is a temperature sensing Click board™ which features the MAX6642 sensor. The sensor is a specifically designed IC capable of measuring its own die temperature, as well as the temperature at a remote PN junction. This option makes Temp-Log 6 click well-suited for monitoring the temperature of a CPU, GPU or FPGA, where the PN junction is typically a substrate PNP transistor on the die of the measured IC. Instead of measuring the PN junction of a specifically designed IC, the Temp-Log 6 click can also use an external diode or a small-signal transistor. Another useful feature of the MAX6642 can also report an ALERT signal if programmed temperature thresholds are exceeded. The MAX6642 features a high accuracy of ±1°C within the range between +60°C and +100°C, which is a critical thermal bandwidth of most IC with the substrate PNP transistor as a temperature sensor. PC systems, i.e. when it is required to monitor both the ambient temperature within the enclosure, as well as the IC die temperature, for test and measurement applications, and similar. For more information about the Temp-Log 6 click, please visit our website.